"We do not inherit the Earth from our ancestors. We borrow it from our children." When you are in the thick of parenting a baby or toddler, the last thing you can even imagine, much less plan for, is their future as adults. I know I have plenty of moments where I am just trying to get through the day. The years may go fast, but the days are a long string of chaos. For that reason, lots of parenting shortcuts exist- tv shows to keep them occupied for a minute, a bumbo to keep them immobile, and pre-made baby food so you can feed them quickly. These things can be counted on to come with some kind of judgement call- we are all supposed to be constantly present, never need a minute to answer a phone call or pee or be a human being. Current "expert" opinion turns against anything that might make life a bit easier. I'm no expert, but I think all of those things make sense, and in the right moment, they are a lifesaver. That being said, there is one mommy shortcut that really burns my toast. I don't understand why people go out of their way to talk crap on Daniel Tiger but this nonsense goes unnoticed. 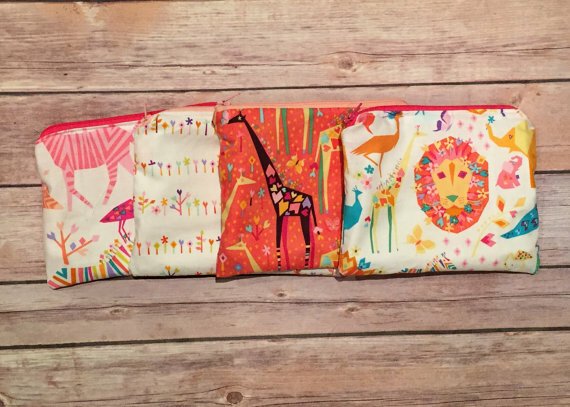 Now, these one time use pouches look innocuous enough, and they are perfect for a diaper bag, right? False, my friend, and they have to go. We may save a minute or two of our time by giving these to our kids rather than taking the time to serve them with a spoon, but they are bad for our kids now and even worse for their future. 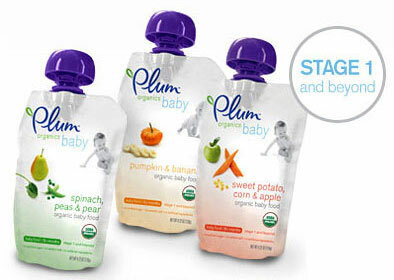 Baby pouches are relatively new, started by Plum Organics this decade and immediately catching on. They took off almost immediately because we as parents are always on the run and what a great solution! Babies and toddlers could eat on the road or out of their chair. You can keep them in purses, etc. But soon after they took off, writing on the pouch began to question them. Even the New York Times was questioning some of Plum Organics' claims. Why are they bad for them now? First, there is solid evidence that the pouches are bad for teeth and teeth development if they go on too long (and right now it seems that the crutch lasts a long time- well into toddlerhood). It also creates long term sugar exposure to their teeth and could cause decay. All in all, bad news for teeth. Second, in this phase of life, a baby isn't just eating for nutrition, they also are learning skills and building habits that develop into healthy eating habits in children. In other words, you are setting a stage, and they need to be starting to work on moving the food around in their mouth and chewing, so if you are still giving them apple mush in a pouch when they should be eating chewy apples, those skills might be stymied. My experience as a mom (to the world's least picky eater, so grain of salt this), is that the best way to encourage a variety of eating is to make your own food with flavor or to mix spices or herbs into the jars. 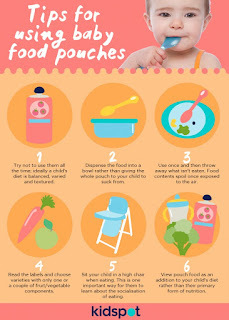 You can't do that with pouches.Our bub eats what we eat, first as a puree and now about 40-50% of every piece of food we consume (more if I really want to eat it).. I know this won't work for everybody, but it might be worth giving a try, and the pouches serve as a stumbling block instead of a help. Third, eating can be a meaningful and fun social interaction between you and your kid, and even if that doesn't play out every time, just handing off a pouch and sending them on their way cuts off that time at the table for building family culture and social bonds that are consistently heralded as crazy important. That whole "eat dinner as a family" thing starts now, and when you have the time to do it, it's probably worth it. Fourth, you spend all this money on food for your baby that is organic, nutritious, and usually has some allusion to nature in the title. Then, you have stuffed it into a carrier jumping with chemicals. The truth is, they still don't understand all of the things leeching out of plastic food containers, and in some of the cases where they have tried to eliminate dangerous chemicals like BPA, the substitutes have turned out to be just as bad. In other word, wha!?!?!? No matter how many plants or suns are on the label, that pouch could be causing actual damage to your child's system or hormones. They just don't know enough, but there is good reason to be suspicious that your wholesome food is being covered in chemical nastiness. PLEASE someone explain to me how this is any easier. What the hell. Lastly (and maybe the most important point I have ever made), I have watched people squeeze those things on to spoons too many times. How is squeezing onto a tiny spoon easier than just spooning it out? Mysteries of the universe. Even worse than teeth, taste, chemicals, and family time is the effect these pouches will have on your little one's future. In fact, these plastic bags of purees have a downright awful environmental impact. One of the worst of anything in your kitchen right now. The pouches are mostly one time use plastic waste, just like plastic bags, plastic straws, and plastic water bottles. This means that after your child's 2 minute snack, they will linger in the soil or water long after you are gone. Plastics are set to outnumber fish in the oceans by 2050, so well within your baby's adulthood. Your child will not be able to safely eat fish or go to the ocean without running into mountains of debris. The only part of these pouches that are recyclable are the lids, so that whole pouch is absolutely garbage waiting to happen. I heard a mom try to justify these pouches as "creating less waste" but that is the opposite of the truth. These pouches are designed to be polluting our land and water. But they are tiny right? This may not seem like such a big deal, but imagine if you weren't allowed to throw those suckers away, you had to keep them in your house. Now how long before they fill the space up? Now multiply that by all the moms you know. This is a huge and completely avoidable problem. Baby food pouches perhaps burn my toast the most because they were basically non-existent ten years ago, and now they are treated as indispensible. I have had more than one girlfriend claim this is the only way they can get their baby (or toddler) to eat veggies and fruit. If you are one of those moms, I still love you and think that you are a kickass mom, but that is crazy talk. Don't feel trapped by the pouch. Trust me, no matter how many suns, leaves, or other symbols of earthiness are on the package, whoever made that pouch does not care about the environment or your kid. They care about making money only, so it is up to you to change the momentum and show baby food companies that such unethical (and expensive) packaging is unattractive, unecessary, and not getting your money. It may feel like swimming against the mainstream current (because it is), but you can do it. 1. 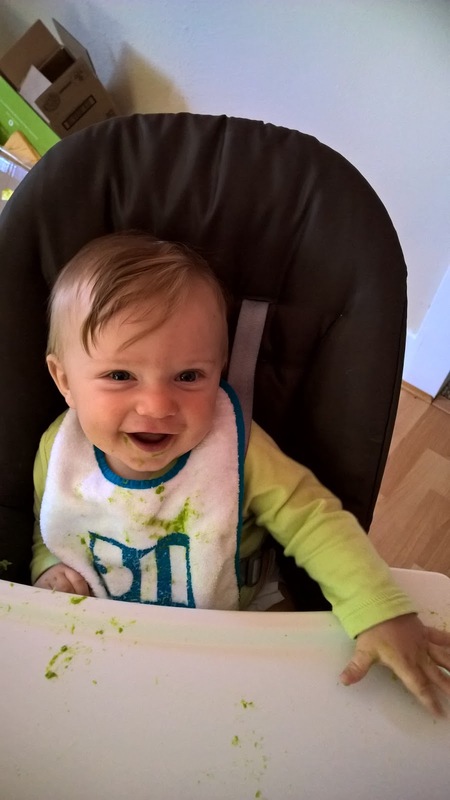 Give your baby something fresh- Sure, a pouch with apple might be healthy, but you know what is healthier? An apple. It doesn't have anything in it to keep it "fresh" and it comes in it's own biodegradable container. Shop the outside of the grocery store, and check out that managers' shelf for deals that will still make perfectly good baked apples or applesauce. 2. Reusable Pouches- THIS. You can control the content of the food better and you will create so much less waste. Sometimes you will still be on the go, but with good planning you can make your own puree or just put baby food from a jar into it. 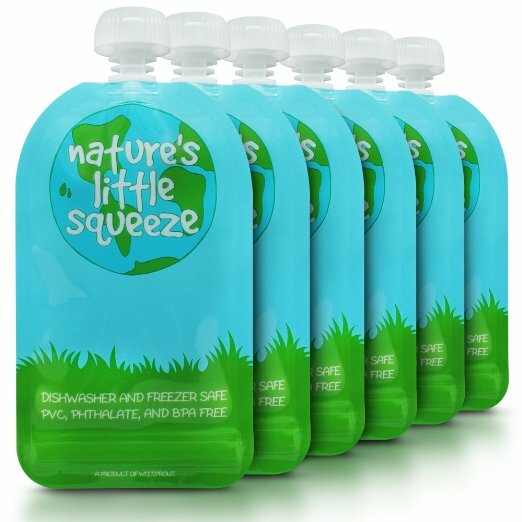 If you use the same pouch even 5 times, that's 4 fewer pouches in your child's water later. Plus, you will save a ton of money- when you pay for pouches, you are paying for the plastic. Try Squooshi, Nature's Little Squeeze, or a silicon pouch from Squeezy Gear. 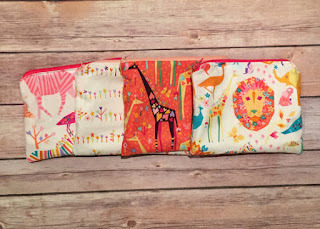 Nourish with Style is an amazing Etsy store to check out too. 3. 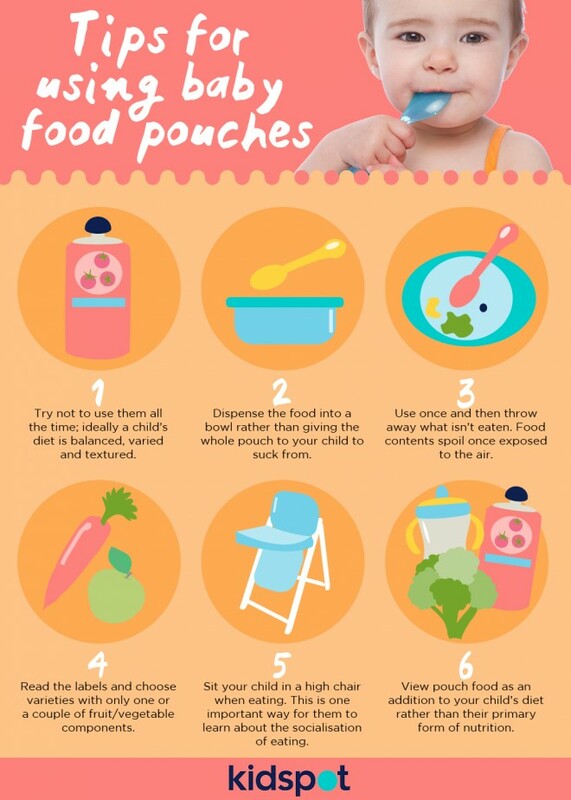 Put your food in another container- Once you hit that toddler phase, a handful of raisins or blueberries in a snack pack can be just the ticket. Etsy has tons of options in all sorts of styles. Re-play Snack Stacks are my absolute favorite- convenient, easy to clean, made in America, and recycled! Kids Konserve also sells a set we use all the time. There are so many easy options for this- garbage packaging is not needed! I know with picky eaters this can be especially tricky, but consider trying juices with veggies or things toddlers can dip (why do they love dipping so much?) as a transition out of the pouch. This isn't about only eating nuts in the woods, it's about finding other solutions that make sense, and even if it isn't perfect, almost anything beats one time use plastic. You can do this! Even if you need the pouches, you can take a reusable option and make your child's world that much cleaner and happier for the future. I get it, sometimes you need the shortcuts to just survive, but I am just saying this might be a battle worth picking and save the pouches for emergencies. 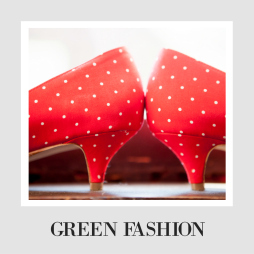 Want more ideas for how to green your regular shopping habits? I got you! 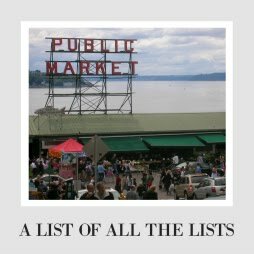 Check out my massive list of shopping lists and ideas! Pouches burn my toast, too! I tried a bunch of refillables for unsweetned yogurt on the go, and I HIGHLY recommend Squeasy Gear over the other options. Silicone is safer than plastic, the design makes it WAAAAY easier to fill and clean, and it lasts *forever. * My 7-year-old still uses it for yogurt in her lunch box. 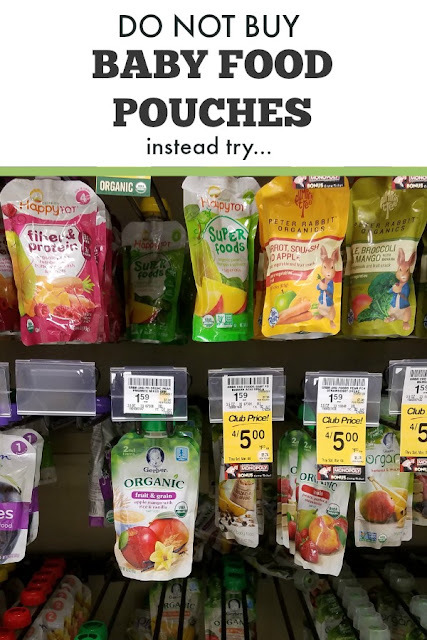 Thanks for teaching moms out there about alternatives to these incredibly wasteful one-use pouches! Thank you! I am trying to get the word out, because I think it could make a real difference! Thanks for your suggestion! You're right for bringing this to our attention. These pouches are so popular because of the convenience but it's good to be aware of the environmental consequences and the affect it has on our children. Great post! I have always been so intrigued by the pouches but never brought me self to using them! With baby number two I am thinking about making my own baby food from home! We actually love using these, we do a mix of store bought and homemade- they are a life saver, and as long as they're not all your feeding your baby, I don't see the harm. Never really used them with our children. They just ended up all over the kids or floor. It always became a game. Wow this is super interesting. My daughter is two and loves these pouches and to be honest with you, I never even gave these consequences a single thought! Lol I feel pretty crummy now. These are great tips. I believe the key is proper planning. That's why those pouches and other convenience foods are so tempting. This is so interesting.. I've used the pouches in the past..definitely rethinking now! This post just spoke to me. I dotn buy them for my soon but ofcourse his grandma does. Its like her littlw treat and i have noticed sometime he want just that. I dont trust them. I rather take a few minutes and make my own puree. Love the reusable option! Haven't heard of that before.. I absolutely DETEST these pouches for all the reasons you write. The fact so many are organic is, in my opinion, the worst form of greenwash going. Thankfully, in France, where I live, they are not hugely common and long may it stay that way ... but there are way too many yoghurt and fruit purée pouches aimed at older children and these are popular. Drives me mad. I have been reading a few blogs lately about organic products packaged in plastic. Its sort of cancels out the organicness really. I find a carrot when baby is in the pram works wonders. Nutritious ,package, free and no mess. I had no idea these pouches were bad for a baby's teeth and development. So scary, but it makes sense!!! Thank you for sharing! Barbara Alfeo Gateway environmentalist. Trying to be a maker, not just a passive consumer. Will settle for active and informed consumer. Lots of ideas for shopping, traveling, volunteering, and parenting while staying inspired! Created with by BeautyTemplates .